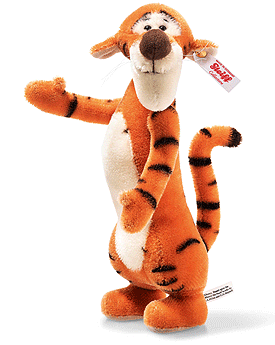 Disney miniature Tigger by Steiff. This beautifull miniature is the perfect addition to compliment our large edition of Tigger and is hand made of finest mohair in orange and white. Limited edition of Only 2000 pieces for the UK and USA. Tigger was featured in the 1968 Disney animated film, Winnie the Pooh and the Blustery Day. He is an exuberant, one-of-a-kind creature with his famously springy tail. His boisterous manner often leads him to leap before he looks, bouncing with a zeal that appeals to his fans of all ages. 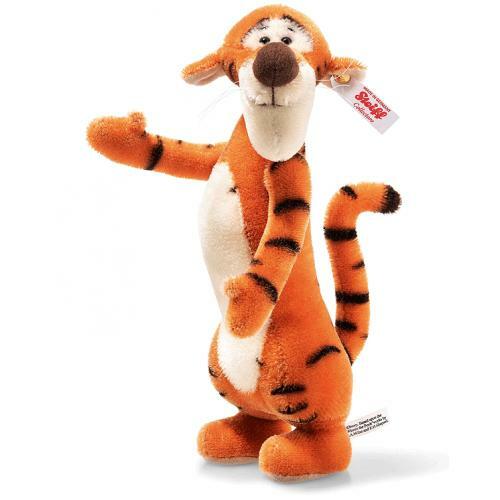 Steiff’s Miniature Tigger stands 24 cm tall and is made of the finest mohair with each stripe air-brushed by hand, making each of the 2,000 pieces, like Tigger himself, truly one-of-a-kind.